Bad things are coming… sometime. 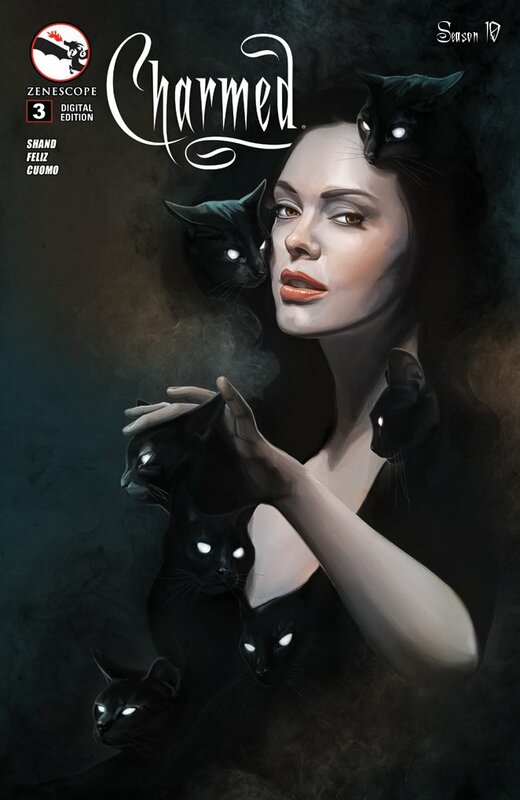 This issue of the Charmed comic gave us all kinds of teasers of what death and destruction may be on the horizon for the sisters, but the looming threats have yet to come to fruition. Then again, if the Charmed Ones weren’t in mortal danger, it wouldn’t be a regular day for them. 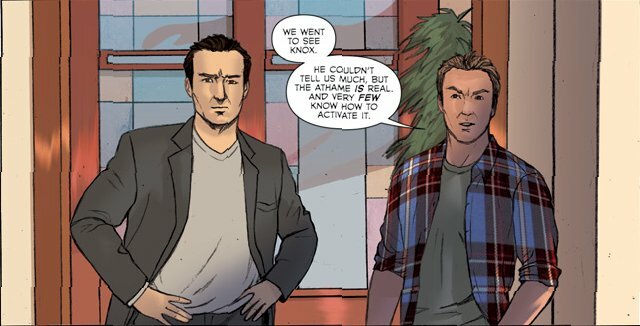 We start off the issue with the odd couple, aka Cole and Leo. I do so miss Leo, since he seems to be nonexistent in the storyline so far. Seeing him and Cole together kind of makes up for that, though, since they’re a match made in Heaven and Hell respectively. The two of them have made their way to the Knox Academy, which is a neutral version of Magic School, in order to find out more information on the Ancient Athame. Meanwhile, the sisters are filling their day with some magic. Paige orbs over to check on Aidel and instead finds his house filled with spirit cats and a book on Egyptian mythology. Orbing the group back to the mansion, she figures out that the cats are Aidel himself, who has done a spell gone wrong. The sisters safely return him to his former self, then get him out the door quickly so that they can concentrate on Cole and Leo’s return and the news they brought. The activation ritual for the Ancient Athame is one of blood — the blood of the one who yields it, the blood of a witch, the blood of an innocent, and the blood of a being that straddles life and death who defies mortality. The latter would be Cole, so theory goes that if they can keep Cole safely out of harm’s way, the spell can’t be completed. Good theory, bad follow-through, as Cole points out. He’s not the only one that fits the criteria, and ending the issue we find out that Valen has learned just such a loophole. He interrupts a Reaper, who is taking a newly dead woman, and instead takes on her soul for his own purposes. Spell looks pretty much complete, which means the darkness is closing in. I hope the sisters are ready for the fight.